What: We gather informally for an hour to chat and get to know one another. Bookcrossing will be giving away free books. Feel free to help yourself to any books that you wish to take home. Just look for the yellow Bookcrossing wagon. Who: Any member of LibraryThing OR Bookcrossing and their family and friends are invited. Authors: Author List - All of these authors will be talking at the National Book festival unless they must cancel for some reason. 1. Please wear something that identifies you as a BookCrosser or LibraryThing member and add a name tag with your screen name. There will be a *huge* crowd on the mall that day and we want to be able to find you! 2. All events are free so come and enjoy yourself. Be there early for best seating as this festival is becoming more widely known and is getting more crowded from year to year. 3. Parking is at a premium or non-existent on the mall. I highly suggest you come by Metro train as there is a Metro station directly on the mall and within short walking distance to the book festivities. Questions for LT-ers or Bookcrossers? Please private message SqueakyChu via LibraryThing or Bookcrossing. I suggest that you join this group and bookmark it to keep up with information related to this book festival. Who's coming to the meet-up? Roll call, please!! I'm planning to be there with the wife. Me and my lady should be there again this year. I'll be looking for the four of you! Not sure if I can make it or not; that's my brother's birthday, and it's the first time since we were kids that we've been in the same city for one of our birthdays, so I may have other plans. No, you need to do what feels right for you, Sonya. When my oldest child was two months old, my husband and I took him to Israel ... and climbed Masada with him. I got many looks of disapproval. We thought it was fun. Anyway, we got to show off our new baby to my family in Israel...in person! Thanks for the blog post. I'm very much looking forward to the Festival. I should be down there. I am really looking forward to it. There are quite a few authors that I like this year. I am so excited I can go this year. I almost always have another obligation on the day of the festival! I will be there! How do I identify myself as a librarything member? Wear a name tag that says LibraryThing and your user name. If you have an LT tee shirt, wear it! I'll be wearing my TIOLI frog tee shirt that says, "It's a Library Thing" (Thanks, Cheli and Donna 828!). I'll also be wearing my Bookcrossing badge that has my screen name, SqueakyChu, on it. Just saw Isabelle Allende and Suzanne collins. Allende was great. Smart an funny. She has just finished a book that is present and starts out in CA and moves to an island in the Chilean Archipelgo (however you spell that). Collins was funloving. Great for the young ones. Went to go get a book stamped by her but the line was unbelievably long. Off to browse some more. Just saw Elizabeth Kostova. She had some interesting comments about myth. She also said we can expect another vampire craze in about 50 years. Ken Follett was great too. I liked him more than I thought I would. He read from his new book. Off to meet the fellow LTers. Here's the Official Photo everyone! You have permission to take the photo for your own use if you are pictured in it. If you were not in the picture, please let us know that. If you were at the festival and couldn't find us (or didn't care), let us know that as well. I'm really proud that we were able to get a few of us together today. I am really, really, really sorry about the meeting place. That has been our meeting place for the past four years, but this year they moved the festival itself to a different place. I was trying to scope out a better meeting place for next year. What about the garden in front of the Hirschorn Museum? There are trees (yay for shade!) and benches and a ramp (for access for the Bookcrossing wagon - assuming crrcookie of Bookcrossing will join us next year). I never did find anyone in my Bookcrossing group the whole day! First row: person one is SqueakyChu (Madeline). First Row, Third Person is veborder (Virginia). It was great to meet other LT Folks! My sister (Rachel, or ArgentFool on Ravelry) and I stood on line at a few signings and got books signed. Didn't sit for any speakers (I know, so bad, but I tend to read a lot of one-book authors). Also enjoyed the Natural History Museum after the meet-up -- on a mission from my twins to bring back something "Egyptian" -- they would have liked a full-size sarcophagus, but the budget wouldn't allow! Sounds like a good meeting spot for next year, SqueakyChu! I saw Isabelle Allende, Suzanne Collins, Elizabeth Kostova and Ken Follett. Had a great time. It was nice to meet you all. Second row, hiding face over my left shoudler: Tanneitha. We saw Julia Glass, Ken Follet, and Martha Grimes. Very interesting, since I didn't think I'd be interested in any of the authors this year. Was it just me or did they not have the same tent set up this year as years past? I was looking for a fantasy tent and couldn't find it. Thanks for pointing out Tanneitha. I was wondering why she wasn't in our picture! I didn't see her behind you in this picture. I think last year's tent was called Fiction and Fantasy or something like that. I'd have to go look it up to be sure, though. I just wrote up a blog post about the meetup. Welcome to LibraryThing! 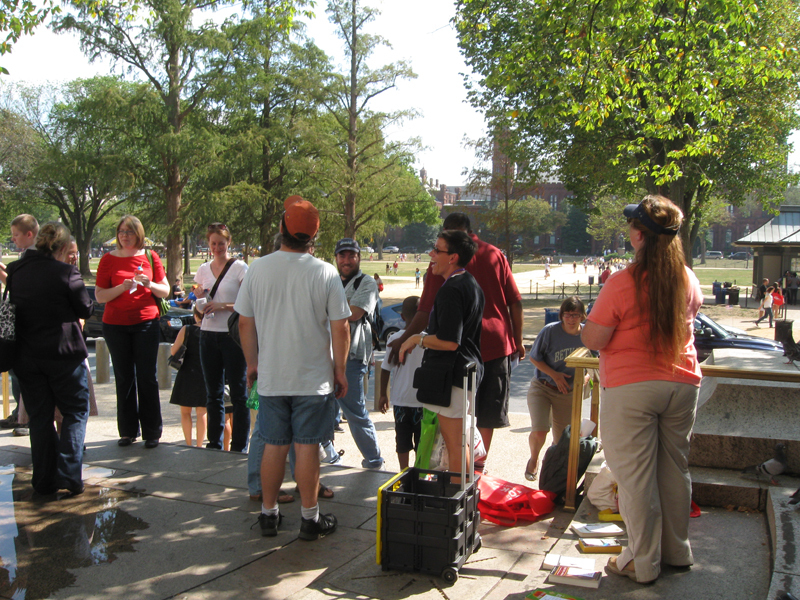 I've been hosting a joint Bookcrossing/LibraryThing Meet-up at the National Book Festival each year, but somehow I lost all of the Bookcrossers this year! nevertheless, I got to meet some member of LibraryThing although no one stuck around too long. I hope to do better next year. I found that the best way to enjoy the National Book festival is to take it slow. I'd advise against book signings because the lines are impossibly long and take uptoo much time. I find it nice to sit awhile to listen to favorite authors as well as authors who are new to me. I am usually impressed by most of the author talks. If you make it back to another National Book Festival, look for us. I'll be posting a notice closer to the actual festival date.